Ang Vaughn: Meet My Scooter! 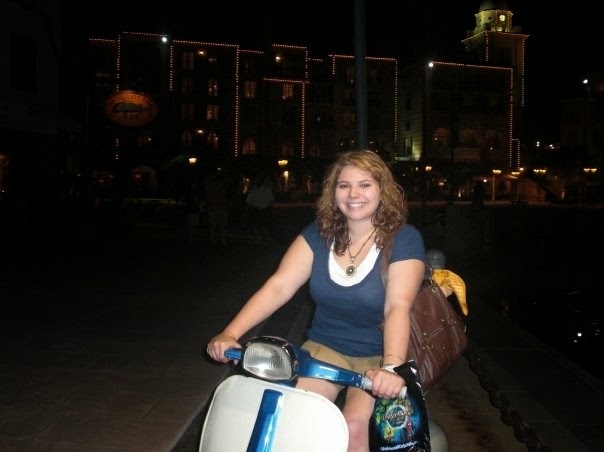 My senior year of high school, I went on a trip to Universal Studios in Orlando and had the pleasure of staying at the Portofino hotel. The Portofino hotel is almost an exact replica of the coastal Portofino, Italy... the hotel itself is gorgeous, there are boats anchored down in the little "bay", a gelato place to die for, and....Vespas. Everywhere. And so my love affair with scooters began. Particularly, Vespas. A couple years ago I decided to embrace the quote "do one thing a day that scares you". So, I saved up, bought a scooter, and then got my motorcycle license so I could be street legal, yo. If you're wondering, 'does she really ride this around freaking Youngstown, OH? '...your answer is yes. And the Harley riders love me. If you're wondering, ' does she wear adorable dresses and flats when she rides? '...your answer is hell no. I wear a full faced helmet, an awesome padded trench coat (from Italy, no less) and usually I'm wearing capris or pants, with boots. I'm so not into becoming roadkill one day. I love it!! You and that Vespa were made for each other :) There used to be a Vespa dealership here in Austin, and I wanted one sooooo bad. Now that I work from home, and do lots of quick 3-4 mile drives, I should totally get one. You have inspired me!! Ahh, thank you so much! Buying my Vespa was one of the best decisions I ever made! They are fantastic on gas, mine gets about 95mi/1gallon, you should definitely get one!!! We could be scooter buddies haha! haha, thank you! sometimes I like to pretend im a total badass on the road with my scooter...and then someone with a loud motorcycle comes and that thought goes away pretty quickly lol. You're living the dream! You look adorable. Buying one is always something I've considered. You need to make me buy one. Since I'm in Pittsburgh, (and if you're in Youngstown) there's additional motivation to make me your scooter BFF. Ha!